The paparazzi will say just about anything to get a reaction out of a popular celebrity. While headline-hungry paps have been known to taunt and criticize celebs to try to get a quote, one (presumably tabloid) photographer took a very strange turn to try to get Kylie Jenner to open up to him outside of Kendall Jenner's 21st birthday party on Wednesday night. As celebrities entered the Delilah nightclub in Los Angeles for the party, a swarm of paparazzi threw out some generic or topical questions at them, which almost all went ignored. The photographer for TMZ asked guests questions like what their favorite cocktail is for a 21st birthday, or if they knew when Kim Kardashian would return to social media after her monthlong absence, but when Kylie Jenner stepped out of her ride and approached the party, he hit her was a bizarre thought experiment. Hey Kylie, would you rather be beautiful and die at 35, or ugly and live 'til 100? The pap's question to Kylie Jenner comes up at around the 30 second mark in the video below. Kylie Jenner left the philosophical question unanswered and walked straight into the nightclub without speaking. The question clearly stems from the perception that the Kardashian-Jenner family's success is built on their external beauty, and that they thereby might place that beauty as more important than anything else. It's a perception that the Kardashian and Jenner girls have often bought into in ways that can either be seen as tongue-in-cheek or full-force acceptance. Kim Kardashian's 2015 photo book Selfish both poked fun at the fact that she is known for vaingloriously taking millions of selfies while also displayed her marketing prowess, given that she knew it would sell tens of thousands of copies, which it did. In a more straightforward route, Kendall Jenner used her good looks to break into high fashion modeling, and Kylie Jenner seized a marketing opportunity after her famously plumped lips received widespread attention by putting out a signature lip kit. Keeping that strange thought experiment out of her mind, Kylie Jenner went on to enjoy her big sister's 21st birthday surrounded by the rest of her family. Though she didn't enter through the front door of the club, Kim Kardashian and husband Kanye West reportedly snuck in around midnight with a cake for Kendall Jenner. The reported appearance is significant given that Kardashian has avoided appearing in public or online since being robbed at gunpoint in Paris last month. 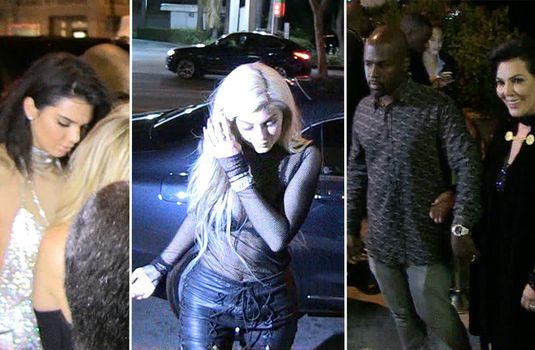 For the big party, Kylie Jenner rocked all-black in a mesh top and laced-up leather pants.